In some ways, growing and maintaining a good-looking lawn in the South is more involved than in the North. Choosing grass varieties is trickier. Some grass varieties do much better when started as plugs or sod than from seed, as is usually done in the North. Maintaining ideal growing conditions for your particular grass type is critical, otherwise unwanted grass varieties will start popping up and will be extremely difficult to remove. For example, St. Augustine grass being invaded by Bermuda grass and vice versa. There are two major types of grass used for lawns in the South: warm-season grass and evergreen grass. Warm-Season grasses are of tropical origin and thrive during the scorching summer heat. They are tough and form a dense lawn cover that thickens as they age. The are not green during the cold spells of winter. Their leaves turn brown in late fall and don't green up again until warm weather returns. In general they are green a little over half the year. 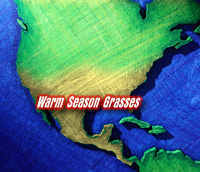 Warm-season grasses are best suited for lower and middle South regions which includes the Coastal areas from Virginia south to Georgia and west through Alabama to Texas. Zoysia grass and more cold-tolerant grasses such as Bermuda can be grown in the upper South which includes the mountainous regions from Virginia and North Carolina west through northern Tennessee and Arkansas. Evergreen grasses grow best in the South during the fall and spring. During the winter months their growth slows, but they remain green for most of the winter. During the hot summer months they will struggle to survive and require considerable care to handle the extremes common to the heat. Evergreen grasses are best for upper and middle South regions. In most situations, evergreen grasses should not be considered as a general-purpose lawn grass for the lower South and Coastal areas. There are 4 major types of warm season lawns with a variety of characteristics and attributes. Deciding which lawn is best depends on your preferences and situation. Consider the following: amount of shade on your lawn, how the lawn will be used (lots of activity, or mostly as a green area that sets off the rest of the landscape), and the height you prefer to mow. Your preference for texture in your grass is another consideration. The four major types are Bermuda grass, Centipede grass, St. Augustine grass, Kikuyu grass, and Zoysia grass. Bermuda grass: hybrid bermuda is fine with good cold tolerance. It does not do well in the shade and can handle activity. Mowing height is low. Centipede grass: has a medium texture with a fair cold tolerance. Doesn't hold up under extreme usage. Mowing height is medium. Saint Augustine grass: coarse texture with poor cold tolerance. Doesn't stand up to heavy traffic. Mowing height is high. Kikuyu grass: is a coarse-textured, light green grass, sometimes mistaken for St. Augustine grass. Zoysia grass: fine to medium texture with good cold tolerance. Doesn't handle shade too well, is fairly good for usage. Mowing height is medium.